I've been intrigued with millet lately. I love it in bread and have been experimenting with it in soups and other things. 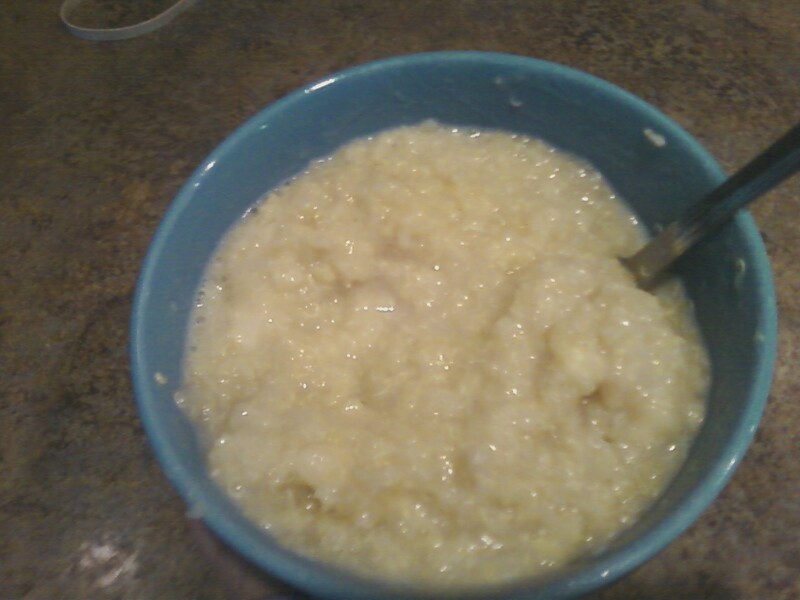 It's really yummy as a hot breakfast cereal and the quinoa here adds another interesting texture and flavor. The recipe was inspired by my google search which turned up this site. I tweaked it a bit to suit my tastes and then halved the amounts so I could eat it by myself for breakfast. I was pretty hungry and prepping for a run this morning and could just barely finish the two servings. But, I also added a banana to the mix so that probably didn't help things. This would be great with some chopped nuts or dried fruit or different kinds of sweeteners. 1. Rinse the quinoa and millet and place in a small saucepan with the water and maybe a dash of salt. 2. Bring to a boil then cover and reduce heat to low and simmer for about 25-30 minutes. Add more water if it looks dry and cook longer if there's still water in the pan. 3. Add desired toppings and enjoy! I'm spending 10 months in France and will be blogging about my foodie experiences.